There was a game jam in which I used Stencyl, but otherwise, all of my projects have been based on my own hand-coded C++ with libSDL. I spent time figuring out how to write a basic game loop, how to design my software architecture, how to create simple buttons to interface with, and more. It’s time I could have been spending designing games rather than implementing them. I know this fact. Over the years, I’ve been told to switch to Flash, or use an engine like Torque 2D or Unity. When XNA was released, I remember wondering if C# was going to become the dominant programming language in game development. But my C++ game engine is still with me, and still relevant. Granted, it’s not as full-featured as some systems, and the asset pipeline is still a manual effort. But what it does feature is well-tested, and I know how it works. There’s something about learning how to build it from scratch that makes development more enjoyable. My A* pathfinding algorithm might make oddly suboptimal paths, but learning how the algorithm works and figuring out how to implement it was a fantastic experience. As you can see from this 2010 development shot of what ultimately became Stop That Hero!, the AI hero should have followed something like that yellow line rather than the path it actually took. It’s sort of like doing my own home repairs. There are some things I’ll leave to well-paid experts, but other things shouldn’t be too difficult to do. For instance, replacing the toilet’s fill valve and flapper took a small trip to the hardware store to get a replacement part and then a few minutes of work. A bigger project I finished recently involved putting lockable doors on shelves we have in the basement. My wife and I are getting licensed to become foster parents, and part of the requirements for our home’s safety include keeping flammable materials such as paint in a locked storage area. I measured the area I needed to cover. I bought the wood and had the guy at the store cut it for me as I didn’t own a power saw myself. 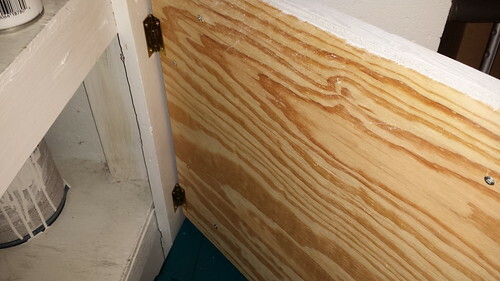 I learned the screws for the hinges were longer than the wood was deep, and I found that you could get 1x4s to frame the wood to make it look nice while also giving the door the thickness needed for those screws. Now, it took some time. I had to go to the hardware store a couple of times to get all of the materials, and I had to spend time on it when I could have been doing something more important, like working on finishing my game before we have foster children in the house. Did this time and effort translate into a better return on investment than the $90 cabinet I thought we could avoid buying? No. In fact, we probably overspent on the wood and other materials for other projects. But there are some benefits to having done it myself. One, I learned 1x4s are not actually 1 inch by 4 inches. I never knew this fact, but when you buy wood, you need to expect your 1x4s will be 0.75 inches by 3.5 inches. It’s about how the wood is when it is cut and rough versus when it is dry, planed, and made ready for sale. It’s just one of those things that I now know for future projects. 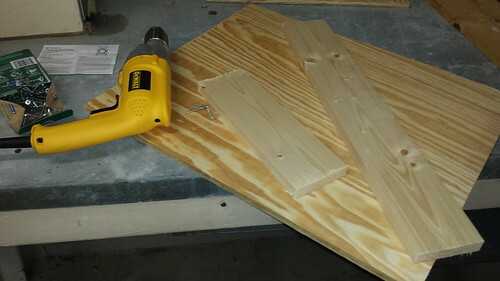 Luckily, the screws I had to attach the 1×4 to the plywood weren’t too long, but that could have been another trip to the hardware store since I was expecting the nominal dimensions to be the actual dimensions. 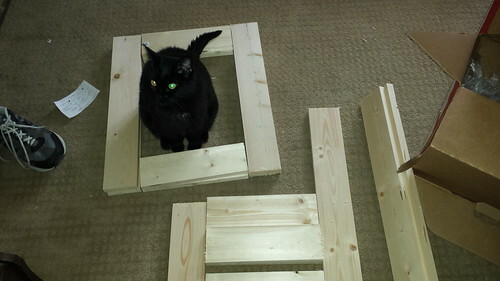 Two, I discovered that I can improvise a carpentry job. 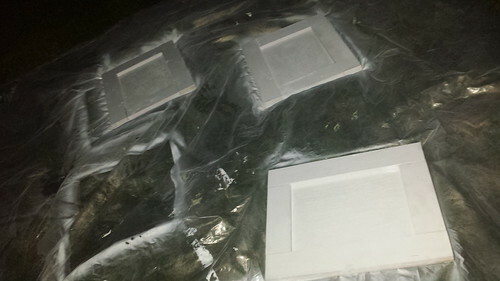 I had not made plans, yet I was able to put together some decent looking doors. 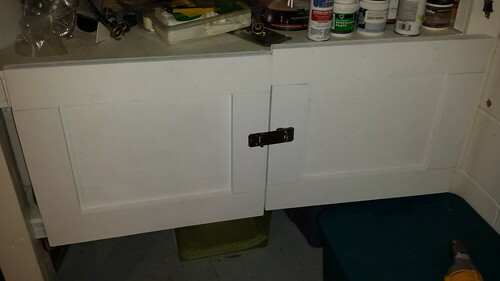 When I ran into trouble, such as finding out that the doors wouldn’t fit where I expected them, I was able to shift them to different parts of the existing shelf and keep going. I could easily have given up when I found out that the doors were just a little too big, but I made it work. If I was doing kitchen cabinetry, I would have been more careful, but this project was more about the functionality than the aesthetics. Three, I have the pride of saying, “I built that myself.” There’s nothing like that feeling. 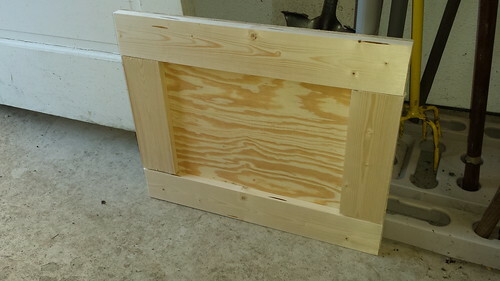 My game development efforts might result in projects that are somewhat askew like my basement shelf doors are. It might take me longer. The end result might be less than what I could have gotten had I leveraged someone else’s efforts. But I am a much stronger developer than I was in the past mostly because of all of the from-scratch efforts I have put in. I did the research myself. I explored from first principles rather than taking the shortcut of an existing path. I understand the trade-offs involved in design decisions rather than accepting decisions made for me. It won’t likely be important to my customers. And it won’t likely be important to you. But as an indie game developer, I don’t have to pay attention to your criteria for what’s the best approach. I can build it myself, a process I enjoy. And next time, I will be more experienced and knowledgeable than I was before. I respect and admire you ability and willingness to “build everything from scratch”. I had the exact same mindset when I started programming back in 1986. My thought was why should I pay for something I can build myself. I carried this mindset with me until 2008. That’s when I got burned out. After a dark period of about 4 years I slowly emerged and re-examined. When I fully woke up I realized I had become irrelevant. I took a fresh new look at why I was developing software. I decided that if I wanted this to go from being a hobby that generated a few sales to a business I had to change my thinking. Marketing and aesthetics took on more meaning. I decided to purchase a canned library and start using it and I found that my time was better spent deciding on the delivery and presentation rather than the “in the weeds” implementation. I get the whole build vs buy thing. It’s great if you can do it. I’m spread way to thin. Yep, I totally understand. I have also started using more 3rd party libraries, so I don’t necessarily do EVERYTHING from scratch. And I know the arguments about focusing on what is important. I just also think not being too dependent on someone else’s proprietary platforms and products is important.